Our loan tracking software is designed to easily provide a method to track regular principal and interest payments, late fees, irregular payment amounts, and adjustments to the principal balance. The software is extremely easy to use and will accommodate adjustable rate loans, principal increases and decreases, balloon amounts, insurance and tax payments, and late fees. You can select to adjust the final payment or adjust the final interest calculation when amortizing the loan. Payments can be entered for full or partial payments. Additional principle payments and additional loan advances can be entered. Loans can provide for a final balloon payment or residual value. Late fees, insurance payments, and property tax payments are accounted for without affecting principle or interest. Payments can be calculated for either annual, semi-annual, quarterly, bi-monthly, monthly, semi-monthly, bi-weekly, or weekly amounts. Payments can be calculated on a weekly, bi-weekly, semi-monthly, monthly, bi-monthly, quarterly, semi-annual, or annual basis. Choose either 360 or 365 days per year for accruing interest. Payments can be entered for any amount including extra principal and balloon payments. Enter monthly insurance and tax payment amounts. Change interest rates without affecting prior interest accruals and payments. Enter principal increases or decreases at any time. 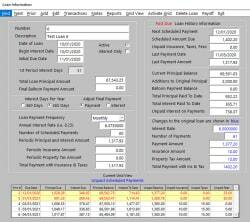 On screen grid displays scheduled loan payments, payments made, or adjustments for the life of the loan. All reports can be printed, viewed on screen, exported to an Excel® spreadsheet or saved as a PDF document. Reports include transactions, payment history, adjustment history, amortization schedule, and payment receipt.